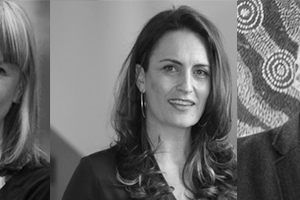 Belinda Duarte is a Wotjobaluk woman who is committed to Indigenous issues and the development of Indigenous people. She is currently the CEO of Culture is Life, a philanthropic program and campaign to support community initiatives that are successfully tackling Indigenous suicide. She is a qualified teacher, was the inaugural Director of the Korin Gamadji Institute and has held a range of positions of responsibility in government and community organisations. Peter Aldenhoven is a proud descendant of the peoples of Quandamooka – the Nughi clan from Moorgumpin, Moreton Island, Queensland. He is currently the President of Willum Warrain Aboriginal Association, a gathering place on the Mornington Peninsula in Victoria, an hour-and-a-half drive from Melbourne. Willum Warrain is a Gathering Place of healing and hope for Aboriginal and Torres Strait Islander peoples down this way. Peter is an Indigenous educator, and teaches across three campuses of a local private school, Woodleigh. Genevieve is Philanthropic Executive of the Portland House Foundation which has a charter to assist people to move out of disadvantage. She brings more than 30 years of experience in philanthropy. Previous appointments include management of the Lance Reichstein Foundation for 12 years, followed by 6 years as an international philanthropic consultant in Australia and New Zealand. Drawing on experience with government, corporations and more than 40 different giving programs and clients, Genevieve has built professional development materials for both Australia and New Zealand, culminating in her book “Savvy Giving : The Art and Science of Philanthropy”, commissioned by Australian Communities Foundation.